Toggle clamping is mainly used for high speed injection molding, whereas for precision parts, ram clamping is recommended. 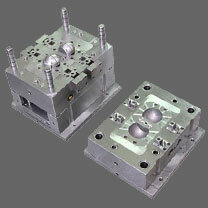 Size of the mold and ejector mechanism can also decide in favor of toggle clamping. There are advantages and disadvantages to each type of clamping unit based on equipment cost, ease of operation, speed, and maintainability. Toggle units are typically more energy efficient than ram units, however the energy used by the toggle clamping unit is small when compared to the energy used by the ram injection unit. Toggles generate tonnage via tie bar stretch, Hydraulics based on ram diameter and hydraulic pressure. Toggle injection machines tend to increase tonnage as they run due to thermal expansion of the mold, tie bars, toggle links and plattens. Without a tie bar strain gauge, you never know what the true tonnage is! Hydraulics remains the same as long the pressure stays the same. Toggle machines open with near full close tonnage ratings. Great for deep draw parts. Hydraulic machines are limited due to the ram design as the pressure is exerted against the shaft seals and wiper. For that reason, the opening pressure is limited. Now with newer clamp designs, the hydraulics is faster and more efficient than ever. Engel uses a smaller high speed cylinder to open and close the clamp; the ram is for clamp tonnage only. That is true of their Duo and Tie Barless machine design. With a Duo the small tie bar mounted clamping cylinders are used to break open large or deep draw parts. For me, high clamp speeds with toggles are scary as you have so much mass/inertia when trying to protect delicate molds. Toggles are robust and in many plants last longer due to their design (poor cleanliness and even worse condition hydraulic oil in the tanks). But mold changes can take longer as the rear platten must move on the tie bar threads to adjust clamp die height for the differing molds; Hydraulics just build tonnage in the new clamp position. I have seen more high speed machines use hydraulic clamps, and either two stage injection or electric screw drives for cycle times and efficiency. I have buy toggle for mineral water bottling plant. plz. tell me I AM done ok or wrong.